ONE OF THE WORLD’S leading liberal economists has rubbished the Fiscal Compact as a “bad idea”, saying he cannot understand Ireland’s vote to ratify it – but believes the euro could collapse within two years anyway. Nobel laureate Paul Krugman this morning said Irish voters should have voted only to support “what is right, rather than trying to appease the Bundesbank”. The New York Times columnist – who on Wednesday had advised Ireland to vote No – told RTÉ Radio 1′s ‘The Business’ that there was a “fifty-fifty” chance of the single currency disappearing within two years anyway, given the pressures arising in Greece. Krugman said that if the outgoing coalition of New Democracy and PASOK lost power after the second Greek general election, it was likely that Greece would reject its bailout conditions and then end up leaving the currency union almost immediately. Even if they managed to stay in, he said, it would only take “about a year” of falling economic growth to put the country at risk of leaving it anyway – a move he believed the currency would not survive. “The ECB does not rise to the occasion, with very very large lending, the whole Eurozone breaks up in a matter of months,” Krugman told George Lee. 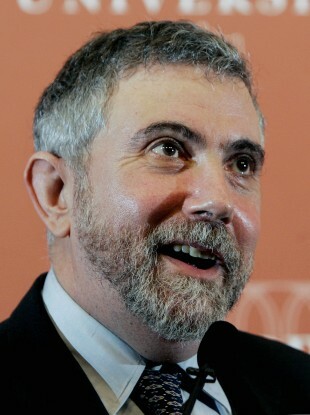 Krugman said he believed there were two “inconceivable”, but equally likely, possibilities – that the ECB’s mandate would be expanded, in order to allow inflation to rise through a process of open-ended lending, or that Germany would veto expanding the mandate and allowing the union to “break up and fail”. “One of those two inconceivable things will have to happen,” he said. The economist had earlier said that the Fiscal Compact was “not at all” a solution to Europe’s problems, saying it dealt only with “imaginary problems, not the real ones”. “Ireland had a budget surplus and a low debt. Spain had a budget surplus and a low debt,” Krugman said, pointing out that both countries were struggling economically as a result of privatising their banking debts rather than through incurring too much sovereign debt. Krugman, who won the 2008 Nobel prize for explaining the patterns of international trade, said the Fiscal Compact would instead force countries to pursue austerity policies – which Ireland had already shown to be ineffective. “Two things were supposed to happen – Ireland was supposed to have an economic expansion, because austerity was supposed to create confidence and lead to economic recovery, and Ireland was supposed to raise confidence in the bond markets. “Neither of those things have happened at all,” he said, remarking that the two occasions on which Ireland appeared to be on the cusp of growth – in early 2010 and late 2011 – had turned out to be ‘false dawns’. This was a particularly good example of why austerity didn’t work, he said, because Ireland had been a “good soldier” in undertaking all the reforms asked of it, but still had not yet been able to engineer a lasting recovery. Email “Krugman: Ireland voted for a 'bad idea' - and euro could collapse in two years”. Feedback on “Krugman: Ireland voted for a 'bad idea' - and euro could collapse in two years”.